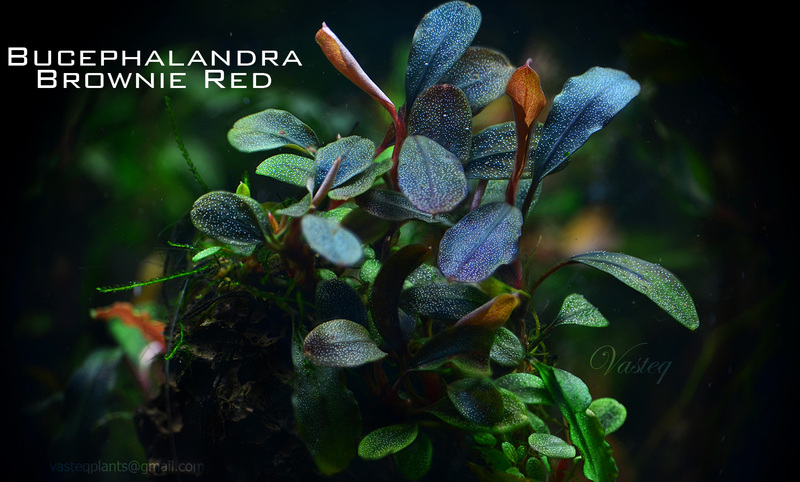 indianaquariumhobbyist.com Forums » Post 342984 » Re: Bucephlandra sp. http://indianaquariumhobbyist.com/community/ :: View topic - Bucephlandra sp. Posted: Fri Apr 18, 2014 2:22 pm Post subject: Bucephlandra sp. and many more with 6 being newly collected in the wild and nobody got around to thinking up a fancy name for them ! Does anyone have any first hand experience in keeping the Bucephlandra sp. - Any Variety, please share. Otherwise I'll have to start on the road to discovery by myself. I know CO2 and light, keep the rhizome off the substrate etc., part of keeping these plants. Any other tips of the trade ? No PMs about price, place and means of getting these plants please ! That should be obvious. 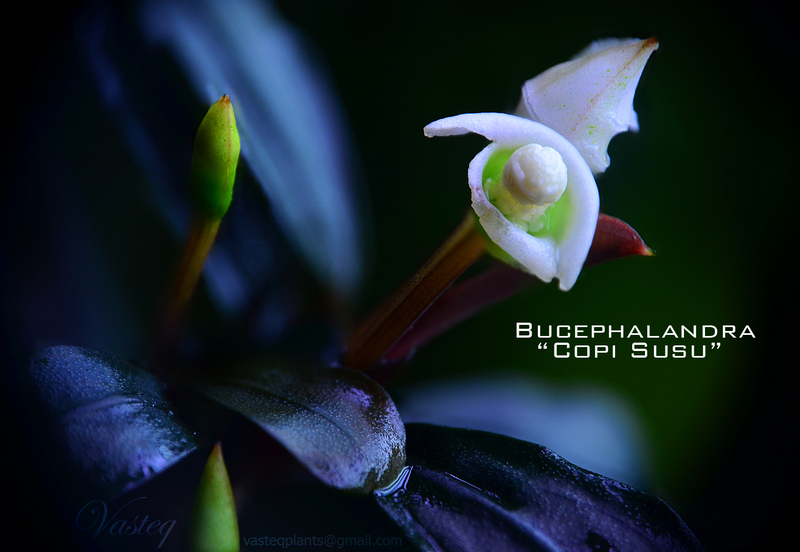 Posted: Sat Apr 19, 2014 11:18 am Post subject: Re: Bucephlandra sp. Posted: Sat Apr 19, 2014 5:04 pm Post subject: Re: Bucephlandra sp. Posted: Sat Apr 19, 2014 6:23 pm Post subject: Re: Bucephlandra sp. What about keeping them with other plants ? Do they loose out ? Where do these names come from - skeleton king ! Posted: Sat Apr 19, 2014 7:12 pm Post subject: Re: Bucephlandra sp. Not much experience here, I had a few rhisomes from sometime, the names I dont remember apart from sedakau which happens to be the most common variety. Initially I had them for 8months in my non-co2(dosed with gluteraldehyde), extremely low light tank. They melted initially and stayed dormant for 2months or so and after that grew a few leaves, approximately a leaf per month. A month ago I shifted them to a decently lit, co2 setup. Again they seized to grow in new conditions. Its obvious that once subjected to new conditions they go dormant and take considerable time to settle in. Posted: Sun Apr 20, 2014 12:32 am Post subject: Re: Bucephlandra sp. They dont really lose out if kept in a tank with other plants. In fact a shady section of a high tech tank is ideal for them if there is decent flow in the area and isnt a dead spot. Posted: Sun Apr 20, 2014 11:12 pm Post subject: Re: Bucephlandra sp. Tom Barr has a Bucephlandra Tank setup, Below is the link which may be helpful .... maybe you could setup something similar as a Bucephlandra sp only tank. Posted: Mon Apr 21, 2014 12:03 am Post subject: Re: Bucephlandra sp. they are expensive mainly because they are available in asia. price has dropped a lot since the craze started. fairly easy plants once converted to submerse. Posted: Mon Apr 21, 2014 12:29 am Post subject: Re: Bucephlandra sp. Not enough for a Buce only tank. Too many $$$$ even if it was available. Kids were abroad for a week, a friend there helped them get all this, and with the packaging. The local influence got me the 6 varieties that have not even been given a fancy name. Practically emptied the feller's stock. I have got small twigs, that's all. Nothing much to go with. a bit to work with. Worst part, tank not ready ! They are in a tub in the bathroom. Posted: Mon Apr 21, 2014 11:34 am Post subject: Re: Bucephlandra sp. Posted: Mon Apr 21, 2014 2:19 pm Post subject: Re: Bucephlandra sp. 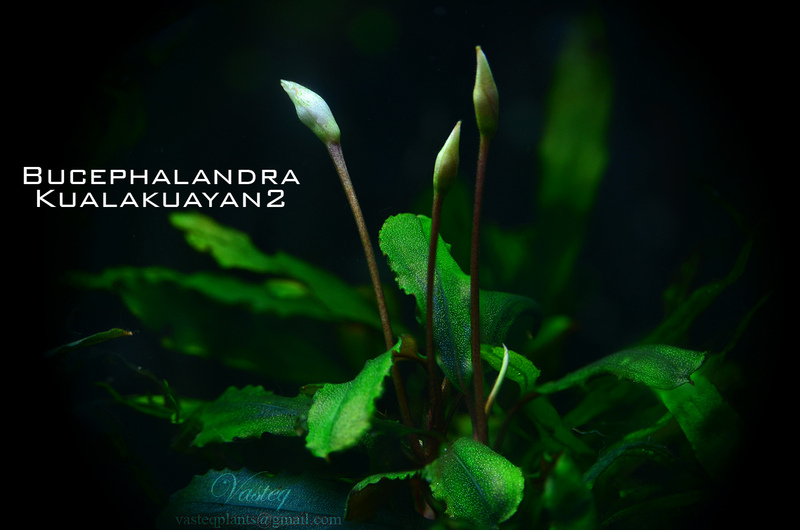 I would like to present my article about one of the most magnificent plants found in aquariums. Article was prepared for one of polish magazine, and translated to english. I would also like to thank Philip Rody and Alan McCormick for help in translating the article. 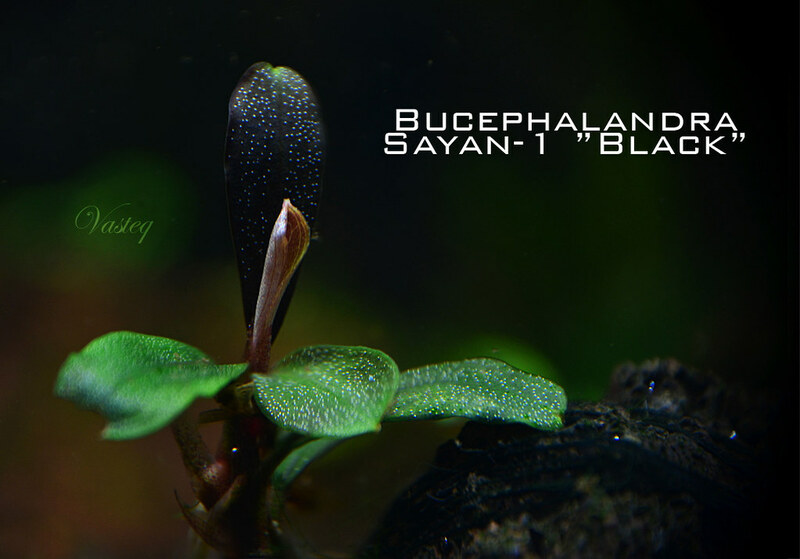 Based on their appearance, Bucephalandras are similar to Anubias and Cryptocoryne species. When they were first introduced to the aquarium hobby, they were compared to Cryptocoryne species because of their narrow and usually olive-colored leaves. However, their creeping rhizomes and prehensile roots fit the characteristics of Anubias more closely. 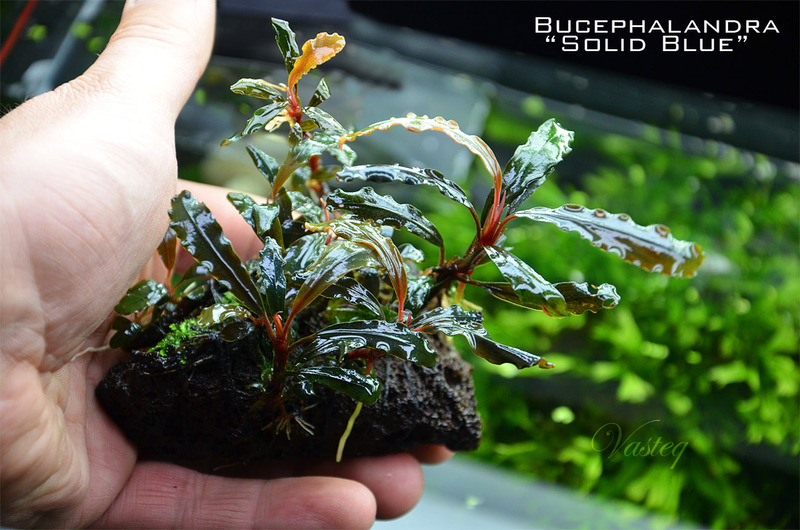 Bucephalandra is a wonderful and still relatively hard-to-find genus of plants that captivate many aquarists across the world thanks to their majestic appearance. Wetland plants from the Araceae family, such as Bucephalandras, are adapted to life in rivers with fast-moving currents. 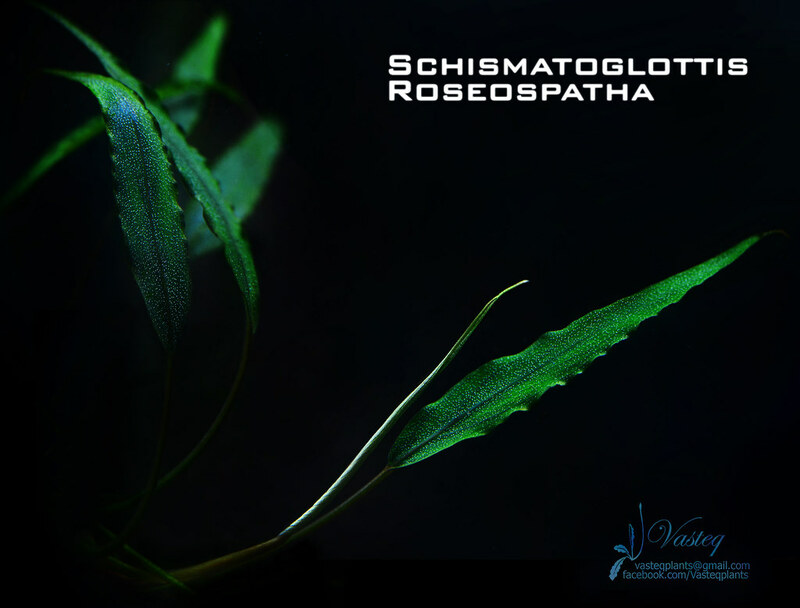 Although they are a relatively new genus of plants to aquarists, they have been known to the scientific world since 1858. 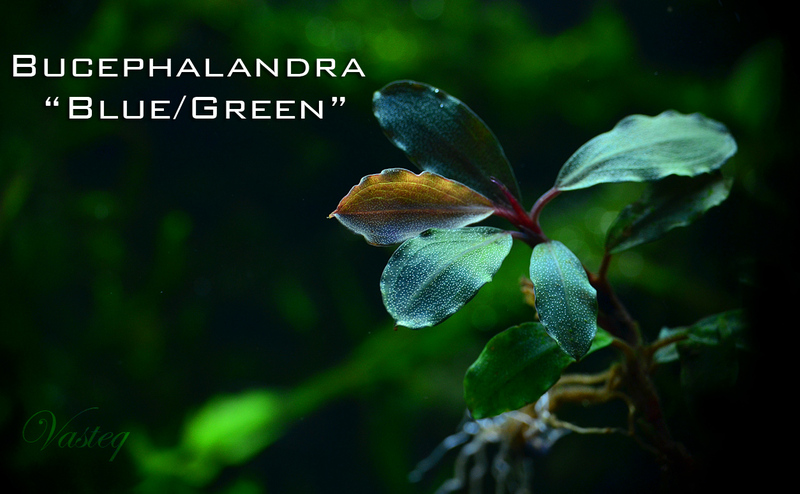 There are two sources of the origin of the Bucephalandra's name. First more reliable source, refers to the three Greek words: bous (bull or cow), cephalê (head), and anêr, andros (man), from the shape of the male staminate flowers resembles the head of bull. According to the second source the genus name Bucephalandra refers to the name of the black horse of Alexander—Bucephalus (in Greek "bous" + "cephalê", ????????? ?, Bukefalos) means "bull" and "head". Alexander's horse had this name because he had a birthmark on his shoulder in the shape of a bull's head. All Bucephalandras are endemic, which means that they can only be found in certain isolated areas, usually in the form of islands. These plants can be found on the largest island of the Malay Archipelago, known as Borneo. 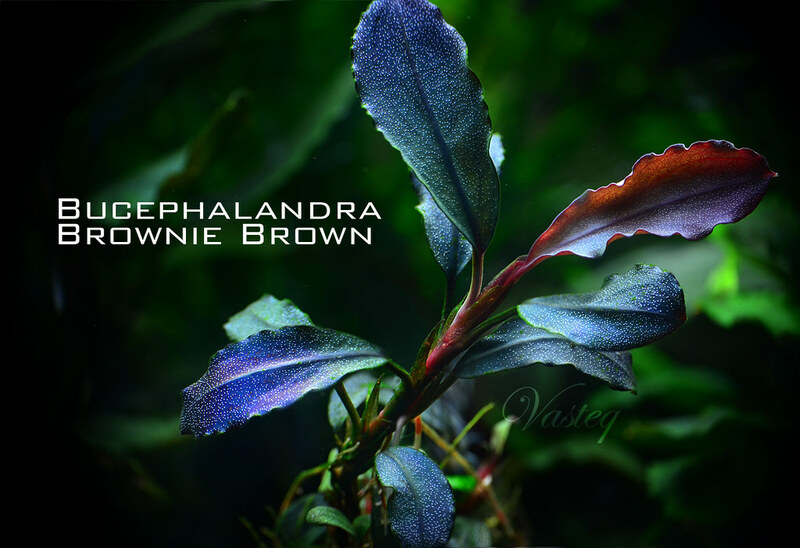 To this day, new varieties of Bucephalandra are continuously being discovered that have not been yet describe in botany textbooks. Bucephalandras are found in rivers and streams, and sometimes on the banks of rivers. Borneo has a tropical climate, which means that there is the same climate year-round with average annual temperatures exceeding 20 degrees Celsius. Despite the consistent climate in some areas on the island, Borneo still has two seasons that are determined by the amount of rainfall. During the rainy season when the river level rises, Bucephalandra plants growing out of water are submerged under water for a few months. However, this does not prevent them from continuing to grow and they can easily transform into their submerged forms. The main differences between submersed and emersed forms are that when they are grown under water, they have a more delicate leaf structure and they exhibit more intense coloration. In aquariums, Bucephalandras can be grown on wood, roots of trees, and coconuts, but from my several years of observation I can say that the root systems of these plants are better developed on hard surfaces, such as various types of rocks. The roots have the ability to firmly attach to hard surfaces, even if they are slippery. Sometimes it is even necessary to use a knife to remove the plant from the surface that it is attached to, because the roots of the plant have grasped the surface so tightly. There is evidence that in times of stress associated with environmental changes (such as changes in light and water chemistry), Bucephalandras may lose some of their leaves. This similarly happens in Cryptocoryne species (which is often referred to as “Cryptocoryne disease”). In my tanks, the sudden changes in fertilization or an algae plague are usually responsible for the loss of leaves. However, this process is gradual and there is rarely a situation in which the plant looses all of its leaves quickly, so it is often possible for the aquarist to treat the problem before all of the leaves have fallen. Even without leaves, if the rhizome and roots are firm and healthy, the plant is still alive and will usually recover over time. From my experience, I have found that completely dimming the light and increasing the amount of dissolved oxygen in the water, at the time of the darkness, can help the plant recover quickly. 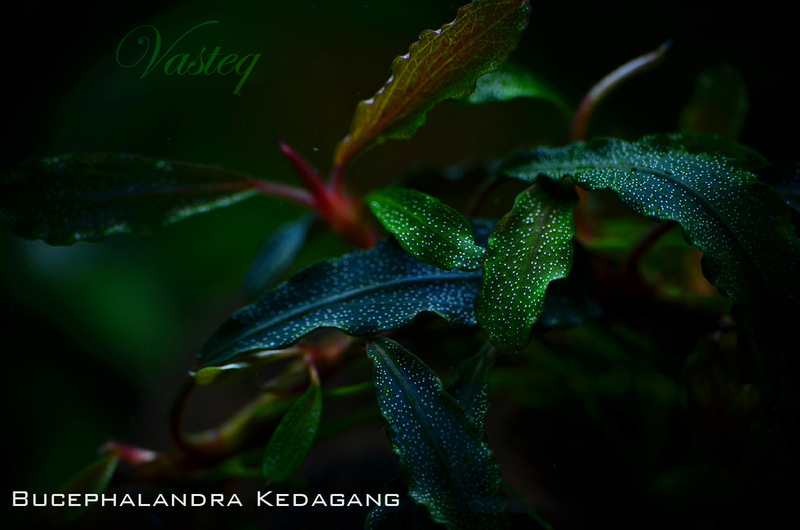 Even on darkness, but well-oxygenated water Bucephalandras can continue to grow and will still produce new leaves, but the color of the plant is usually not as eye-catching. Helpful is also partially bury plant into the fertilizer substrate. When the plant will bigger and root system stronger then you can attach it back to stones or pieces of wood. 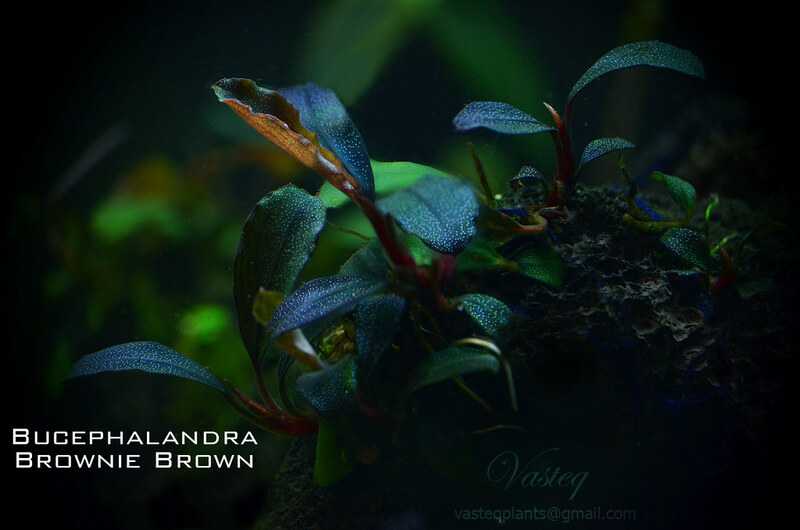 This is also good way to strengthening a small and weak pieces of Bucephalandra. To ensure good coloration, stronger lighting is required (0.5W per litter or more), and additional fertilizing through the water column is beneficial. Even small amounts of CO2 and fertilizer can help the plant display attractive colors. In my aquarium, I follow the Estimative Index fertilization method, which allows the plants to have a large amount of fertilizers in the water column to utilize. I have noticed that certain fertilizers can help improve the color of the leaves. Additionally, through my exchanging of plants with many aquarists who have “low-tech” aquariums, I have noticed that the leaves of the plants grown in such conditions are not as colorful because there is less light and not as many fertilizers for the plants to use. 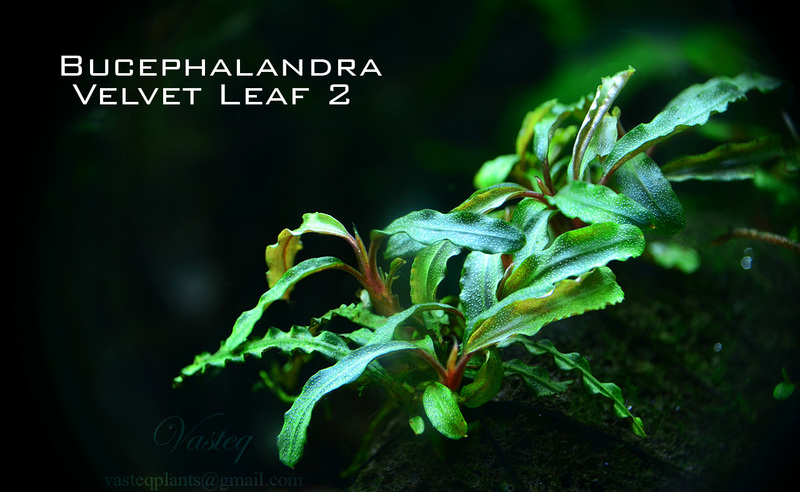 Bucephalandras can also be grown in paludariums, but the coloration of the leaves tends to be weaker, and the leaves tend to be less elastic as well. They must be provided with high humidity in order to thrive in such environments, otherwise the leaves can dry out. The parameters of water that Bucephalandras can tolerate are as follows: pH range of 5-8, almost any GH and KH, and a temperature between 22-28 degrees Celsius. At the beginning of my adventure with Bucephalandras, I heard that they cannot tolerate temperatures higher than 28 degrees Celsius because it could cause the leaves to melt. However, I have yet to see this happen with my plants, especially when the water temperature rose to 32 degrees Celsius and I did not notice any negative side effects. 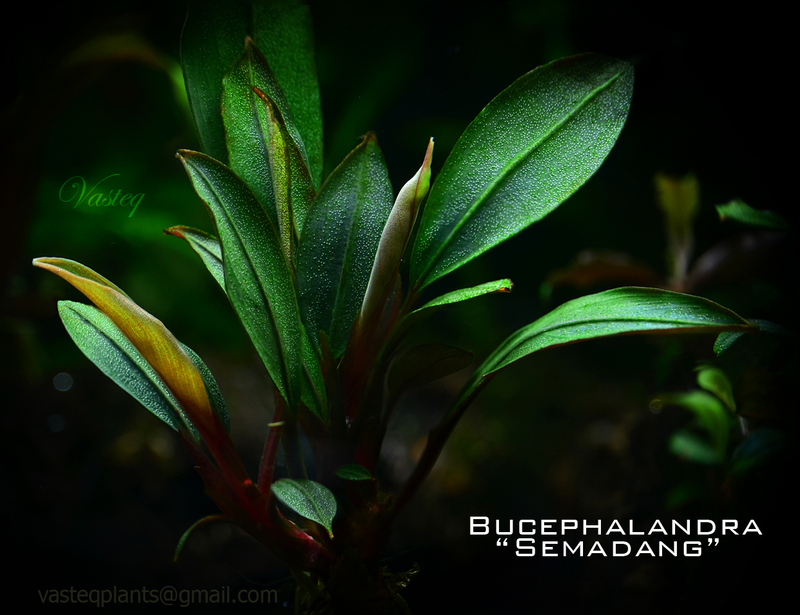 It should be noted that due to the fact that Bucephalandras are a type of rheotype (plants that like swift-flowing currents), we need to provide similar conditions in our aquariums in order to achieve the best results with these plants. Such currents can be achieved by using an internal filter, or the plants can be moved near a filter outlet. 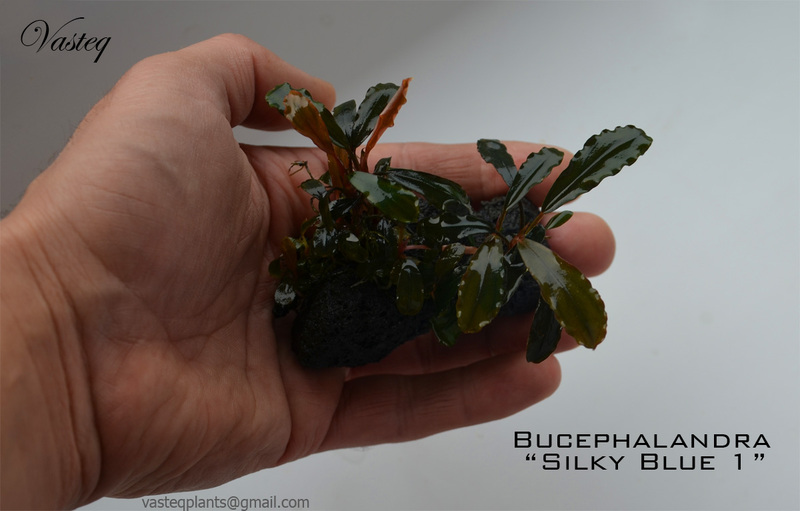 The leaves of Bucephalandra are flexible because of the aquatic environment in which they are found. For Bucephalandras, I have found that the growth rate is dependent on the variety. Some varieties can produce 2 leaves per week if they are in optimal conditions, while others will produce only 1 leaf every 2 weeks. Generally it is said that they are slow-growing plants, but if you provide them with strong light, fertilization, and plenty of CO2, you will achieve the fastest growth possible. Flowing begins mainly under water. It’s hard to tell what factors cause the plant to produce a flower. Flowering of Anubias species is often accompanied by deteriorating environmental conditions and is regarded as a form of survival for the plant. 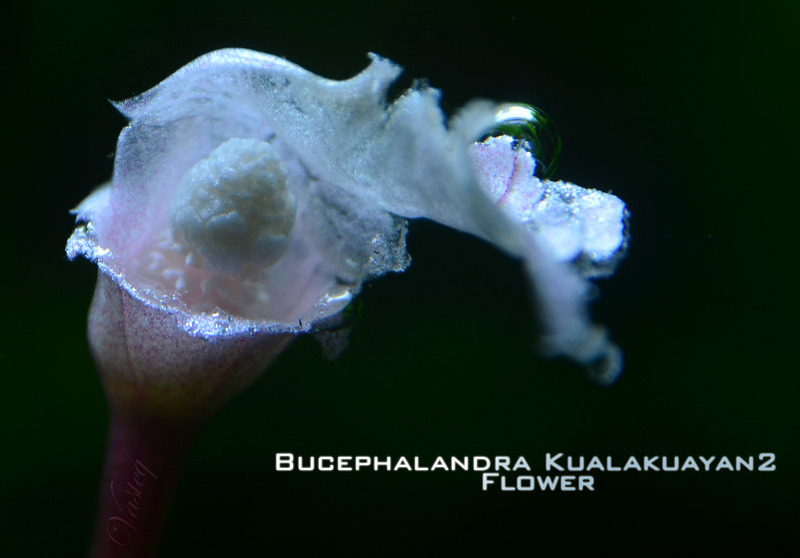 However, Bucephalandras can flower when they have access to an ample supply of nutrients, and are in ideal conditions. They can even produce more than one flower at a time (photo below). Because Bucephalandras grow so slowly, green spot algae is a common problem, which may limit access to light and also slow down the growth rate of the plant. However, they are quite hardy and most algae types can be removed by using a 10-20 minute bath in a solution of citric acid (one teaspoon of citric acid to 1.5 cups of water). This mixture is too weak to damage the leaves of Bucephalandras, but it is strong enough to kill the algae. A better way is to make a solution of liquid carbon (glutaraldehyde, under the brand name CIDEX, commonly used to disinfect surgical tools.) To 500ml of water, add 4 ml of glutaraldehyde, and bathe your algae covered plants, stones or mosses for 5 to 10 minutes. This is a better way to kill the algae because it’s safer for delicate mosses and liverworts and can kill more types of algae. To kill the green spot algae you can spray the leaves with peroxide (3%). 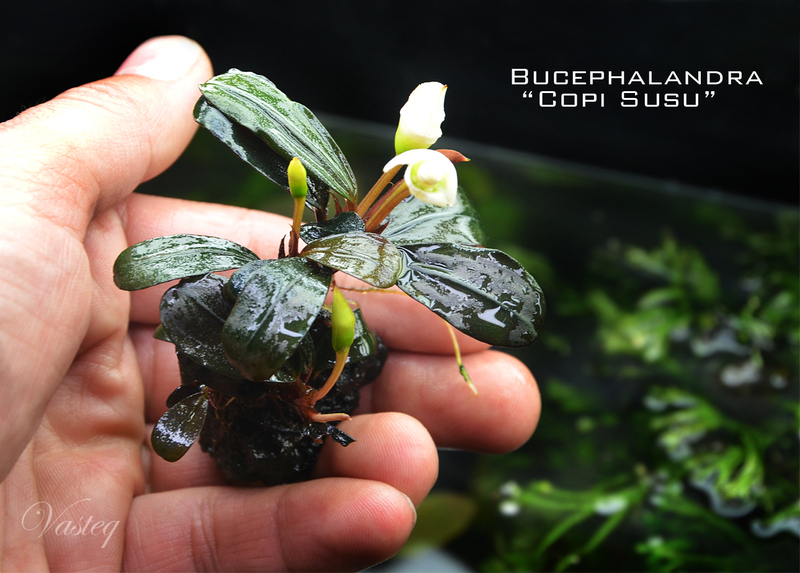 Currently, only three species are described in plant textbooks: Bucephalandra gigantea, Bucepholandra magnifolia, Bucepholandra motoleyana. However, one can encounter more than 200 variations of trade names, and many of these may be new species that have yet to be described. Because many species names are currently unknown to science, the trade names are created based on the names of regions, rivers, or states where they were collected (e.g. Kedagang, Kualakuayan, Tapah, Sabah, Kalimantan, Sintang). The names are also created according to the coloration and shape of the leaves (e.g. Brownie Brown, Red Gaia, Super Blue). An interesting example of the names of these plants is Brownie Ghost, which appeared only once in a certain area and then disappeared. In the aquarium hobby, Bucephalandras appeared as recently as 2005-2006 and immediately became popular. The plants are very expensive, but over time they will become more affordable. What makes Bucephalandras so interesting is their very appealing leaf shapes. There are a variety of leaf shapes that are similar to the leaves of cherry and apple trees. The leaves may be oval with flat edge, oval with wavy edge, long and straight, long and wavy, or even almond shaped or like a drop of water. The colors of the stems are mainly pink or red, but the leaves can be multi-colored. Depending on the species, some leaves can have almost all colors of the rainbow. There are many varieties, where there appears to be a "blue gloss" on the leaves. This characteristic is interesting because the gloss is only visible when you look at it at certain angles. In some varieties, we can also see other colors similar to a bright green gloss, or the color of copper or reddish hues. There are relatively few varieties which are typically green (e.g. Shine Green, Treasure, 2011), and the most attractive are the variety of dark navy blue leaves (e.g. Brownie Brown, Kedagang, Black Centipede, Black Leaf, Central Kali). 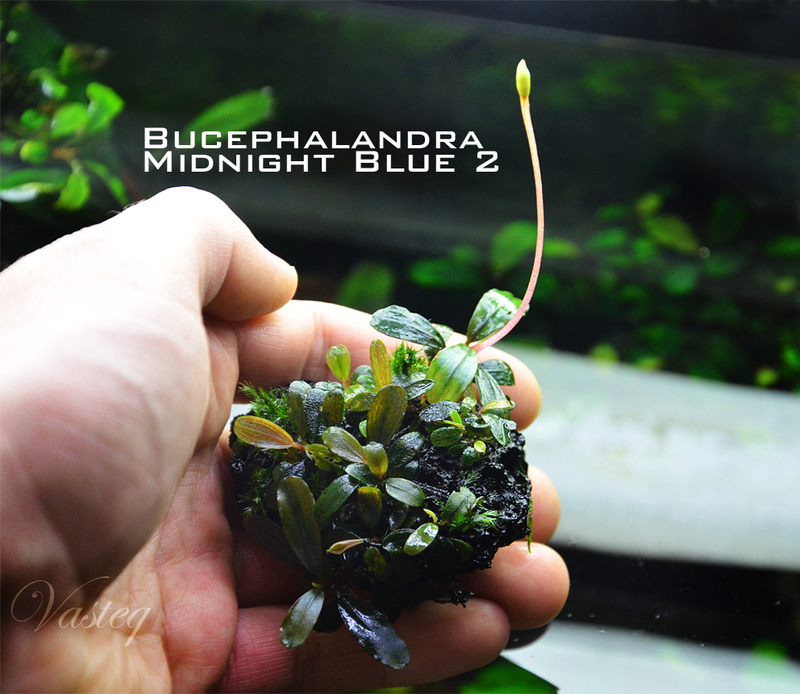 Bucephalandras are typically a small plant. Many of them only grow up to 3-5 cm. But there are also many that grow larger (8-15 cm) and even larger variations growing up to about 25 cm in height have been found. 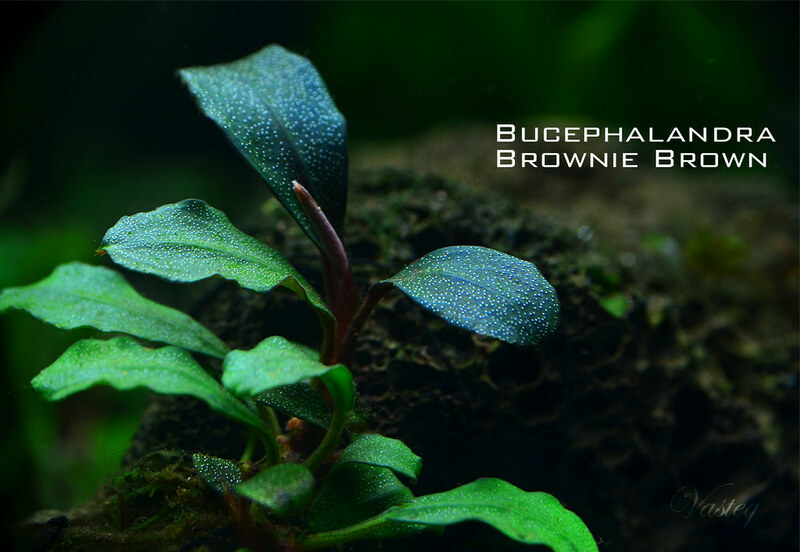 A distinctive and recognizable feature of all Bucephalandra are bright spots on the leaves, mistakenly recognized by many aquarists as air bubbles resulting from the process of photosynthesis. These spots are found in most varieties of Araceae plants (photo below shows other araceae's plant: Schismatoglottis). Depending on the variety, the arrangement of dots may be more or less intense. Similar spots can also be seen on Anubias, but they are not as noticeable. 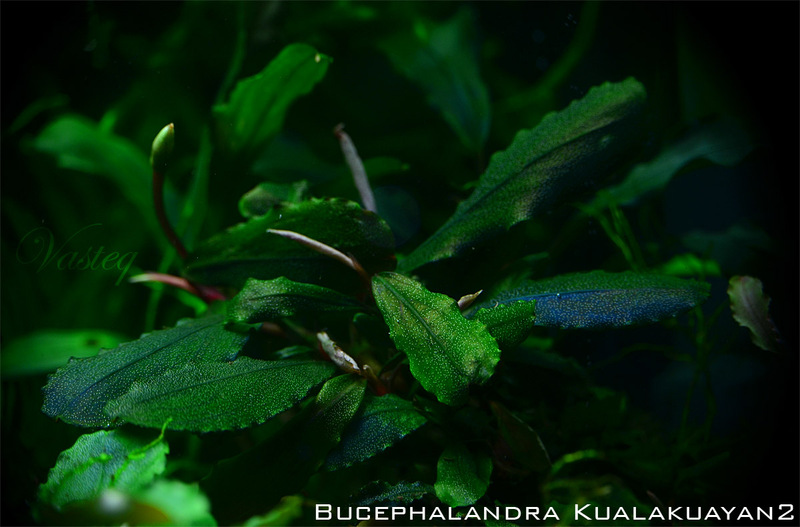 On emersed forms of Bucephalandra, the spots are less visible, with their intensity increasing when the plant is submerged. Posted: Mon Apr 21, 2014 2:40 pm Post subject: Re: Bucephlandra sp. Posted: Mon Apr 21, 2014 2:43 pm Post subject: Re: Bucephlandra sp. Posted: Mon Apr 21, 2014 9:51 pm Post subject: Re: Bucephlandra sp. I shall not contaminate the Bucephlandra in a well settled tank ! Posted: Mon Apr 21, 2014 9:54 pm Post subject: Re: Bucephlandra sp.